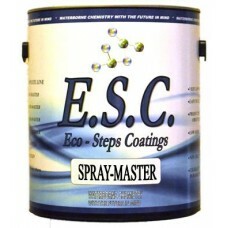 SPRAY-MASTER is a premium, self-sealing waterborne pre-catalyzed..
SPRAY-MASTER is a premium, self-sealing water base lacquer, designed for the toughest of situations. SPRAY-MASTER dries to a film that is hard enough to be buffed to a mirror finish yet maintains its flexibility. Its unique formulation gives this product a smooth “waxed” feel that is different from most waterbornes. Ease of application, hi-build, and quick dry-time are properties built into this unique finish. have applied too much and dry time will be lengthened substantially. immediately after sanding. It is safest to apply no more than 2 -3 coats per day. Product must be completely dry before another coat is applied. Maximum hardness occurs after 7 days. Clean-Up: Clean and flush all equipment with water immediately after use.